Hi Friends, Today we are sharing a rooting tutorial. Lenovo a7000 is released on April, and still selling through flipkart. And almost every user need root access for their phone. But it is not possible to root lenovo a7000 through kingroot , flamaroot or any other 3rd party applications. 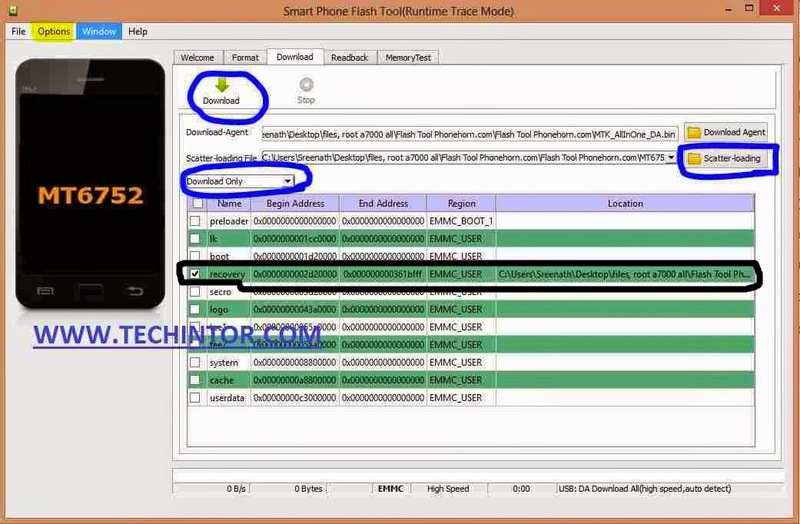 But here techintor.com sharing a working method to root Lenovo a7000 successfully. below we are sharing full steps to ‘ How to install CWM recovery and Root Lenovo a7000’. Me too a lenovo a7000 user and tried many methods to install cwm recovery and root lenovo a7000 but all methods failed. At last I am installed cwm recovery and rooted my lenovo a7000 through below described method. So follow the steps carefully and install cwm recovery and root your lenovo a7000 successfully. 1. Windows Pc, I recommend you to use Windows 7. Because I tried this method on windows 8 and windows 8.1 but not worked for me. DISCLAIMER: In no means we are responsible if you brick your phone or your SD card dies or your phone behaves abnormally. It is your sole and your own responsibility to root your phone. If you’re unable to boot up your device or cannot root then it is not our fault. We warned you already about this. 2. Now install Vcom driver on your windows 7 PC. 8. Now switch off your device and pull battery out. 10. connect the mobile without battery first ,wait few seconds and insert the battery while the device is still connected. I hope that you are rooted your Lenovo a7000 successfully. I already told you that me too a lenovo a7000 user and rooted my lenovo a7000 successfully by the above method. I am very much thankful to techolaty admin and AJ for helping me to root my lenovo a7000. If you have any difficulties or queries , just comment here and I will answer fast as I can possible. How to set only LTE network?? you mean, to set lte network default in phone? install mtk engineering mode from playstore. go to mtk settings and change network selection to lte only. I want to remove the cwm recovery, and only need the rooted phone with original recovery on it. Please contact me. I think It is not possible with available tools. For rooting lenovo a7000 , you need a custom recovery. anyway if there is a way to root lenovo a7000, I will update this post including that. You need to connect your mob to PC without battery. connect the mobile without battery first ,wait few seconds and insert the battery while the device is still connected. please do all these steps in windows 7, and make sure that you are installed Vcom drivers. Thank you.But now i was followed with another problem.I installed all the 2 inf files.And after connnecting mobile without battery and then with battery, the bar under the flash tool went 100% and then showed an error that the phone is not responding.Is battery % a matter.I had 50% of my battery. did you followed these steps correctly? when I plug USB cable without battery and wait some seconds then put battery I but device steel not connecting plzz help me i install vcom drivers but it's not working plzzz help me & contact me on WhatsApp 9716109149 …..
you are using which OS? win 7 or 8.
we recommend you to use windows 7. Will this wipe my phone's data? after completing sp flash ,when i entered install update package it's showing install failed. suggest me a solution. The backup/ restore function in this maxritz version of recovery is not working. At least not on my phone anyway. It creates a backup, but it doesn't restore it. It says it is restoring it, but the phone doesn't boot after completion. I will stick with the cwm created by puchupechu from xda. After removing USB pressinf the 3 buttons simultaneously is'nt working. I mean I'm not able to go to recovery mode.